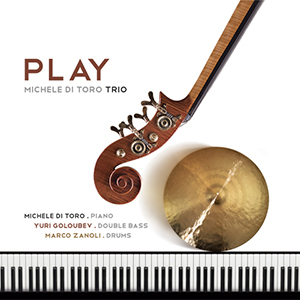 AS THE PURITY and subtly impish equilibrium of the sleeve art suggests, the elegant artistry displayed in this trio album, Play, from Italian pianist Michele Di Toro is undeniably breathtaking. Clarity, balance and crisp technical execution are immediately discernible as the album proceeds – but, importantly, there is also the lifeblood of emotional sensitivity which undoubtedly flows through the veins of this music. Lutetia launches the ten-track sequence, characterised by a wistful, seemingly-perpetual (Escher-like) cycle of shifting minor keys which introduces Yuri Goloubev’s unmistakable, deftly cantabile bass soloing; the quickening tempo spotlights both Di Toro’s bright, Jarrett-inspired pianistic style and Marco Zanoli’s incisive, percussive brilliance. There’s a quirky charm to waltzing Ninna Nanna, with its bass harmonics, reverse-processed cymbal scrapes and an amiable development of melody (even a hint of Svensson’s e.s.t. ); and the spirited bossa nova of Yuri Goloubev’s Daunted Dance prompts Di Toro and Zanoli to wallow in its unalloyed positivity. PART OF ACT’S ‘DUO ART’ SERIES, ‘Reverie at Schloss Elmau’ brings together two good friends from the contemporary jazz world – British pianist Gwilym Simcock and Russian (Milan-resident) double bassist Yuri Goloubev – for a programme of gloriously poetic brilliance. Situated in Germany, towards the Austrian border, Elmau is a favoured stomping ground for Simcock – a recording retreat of creative calm, and the location for his solo piano album, ‘Good Days at Schloss Elmau’ (ACT, 2011). In this same environment, the pianist and bassist have woven together a sumptuous tapestry of co-written originals, drawn from their illustrious classical and jazz experiences – the appeal of this crossover confirmed by their recent, well-received live performance on BBC Radio 3’s established, chamber-focused Lunchtime Concert slot, as well as many international stage appearances. Recording together previously (on ‘Blues Vignette’, as a trio with James Maddren – Basho, 2009), it’s clear that Simcock and Goloubev have developed a strong telepathic communication, their compositions leaping to the vibrant rhythms of jazz, as well as incorporating the grace and complex harmonic language of (amongst others I hear) Debussy, Ravel, Brahms and perhaps even Gershwin. Both musicians approach their craft with exacting precision, each able to ‘turn on a sixpence’ from emotional yearning – often characterised by Goloubev’s sustained, rhapsodic arco – to the tumbling, overflowing joy of Simcock’s dazzling piano. Pastoral begins the journey with a pellucid, spacial simplicity which resembles Scandinavian folksong, pictorialised by droplet- and icicle-suggested effects before gaining gently-paced momentum – the first indication of the extraordinarily sensitive interaction that permeates the entire album. Also, it soon becomes apparent that these nine pieces are not for the background but, rather, demand close attention to fully appreciate the detail – indeed, importantly, at louder volumes the physical resonance is such that it’s easy to become involved at a much more intimate level. As an illustration, in Lost Romance, Goloubev’s lithe fingerwork annunciates every passage with such amazing depth, melodic accuracy, ringing harmonics and vibrato… it really is breathtaking, especially for an instrument so often consigned to plodding support! Shades of Pleasure explores major and minor keys with a luscious intertwining of piano and bass between its gently jarring main theme, set against a smoothly-ebbing piano ostinato, Goloubev again demonstrating his considerable dexterity. In contrast to the duo’s quieter moments, Antics is a wondrously frolicking episode based around a familiar ‘playground jibe’ motif which the pair gladly tease each other with. 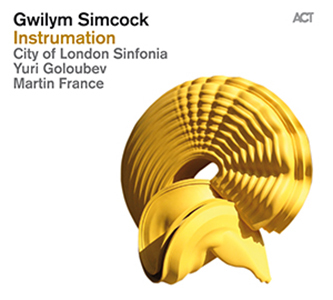 Simcock seems to be establishing an upbeat pianistic style all of his own, featuring heavily accented chords and bounding baselines, best described as a ‘breakneck blues’ – such a compelling listen; and Yuri does well to chase him closely into every corner of these brisk four minutes. A Joy Forever tugs at the heartstrings, a beautifully emotive tune from the exquisite, cello-like fluidity of Goloubev, his switch from arco to fingered bass no less sublime (I recall seeing a young Gwilym Simcock playing many years ago with legendary drummer Bill Bruford – Earthworks, with Tim Garland – and the loftiness of this piece brings to mind Bruford’s own piano and bass gem, ‘Palewell Park’). Non-Schumann Lied might be seen as reference to the artists’ classical beginnings, its songlike impressions maybe more elegantly Brahmsian in flavour; and Flow eddies and skips along to the lucid, colourful melodies that both instrumentalists share so keenly. The leggero ‘song without words’ feel of Vain Song finds Goloubev once again displaying a remarkable lightness of touch, Simcock hitting the heights of jazz soloing finesse (listen closely – this is a real treasure). And finally, an almost Elgarian Reverie (from the pen of 19th Century bass virtuoso Giovanni Bottesini) – its subtle Victorian shades, reminiscent of Chanson de Nuit, find Yuri Goloubev at his most classically lyrical (though not without idiosyncratic improvisatory interlude) against the restrained romantic piano of Simcock. 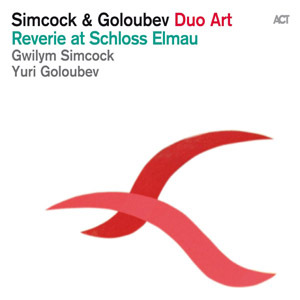 Gwilym Simcock and Yuri Goloubev are, separately, to be found in many different guises in a currently buzzing contemporary jazz scene. But here, they pause to forge beauty and majesty in this coming together of two acoustic instruments – illuminated, of course, by their combined musical genius. ‘Reverie at Schloss Elmau’ is released on the ACT label – more information and audio samples here.